Call Boat Owner Bill 763-447-7990. Description: 1990 Catalina Capri 26 Sailboat. 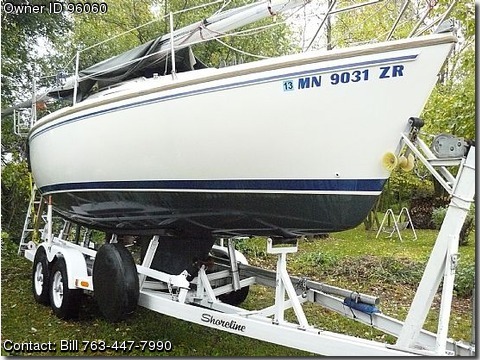 Very good condition Always in freshwater, on a scale of 1-10 this sailboat is a 9.5 This was a one-owner boat when we purchased her in the Fall of 2012. We love the sailboat but personal circumstances force us to sell her. Comes fully equipped with 9.9 hp remote controlled electric start aux- motor, 5 sails, whisker pole, roller furling jib, new 2012 full battened mainsail, two anchors, wind-speed-depth instruments, CD player, VHF radio, carpet, compass, head, stove, icebox, sink, dual batteries, solar panel for charging batteries, custom mast raising system, and a dual axel trailer that is in great shape. This sailboat has a tiller, a 3.5' wing keel, and is very stable, you can sail her anywhere.